Even the most self-assured and positive people can have days where they feel emotionally defeated and out of control. Being self-empowered isn’t a magic state of being that is achieved and never goes away. It’s an approach to life that needs constant work, assessment, and care. When you have days where you’re not feeling empowered, it’s important to take extra care of yourself. These are the days when you need a little extra support and attention. 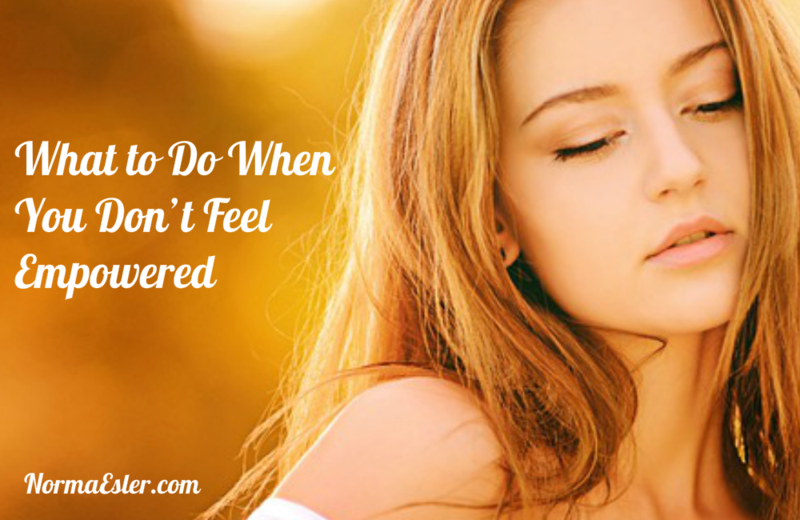 So let’s talk about what you can do when you’re not feeling in control over your life. There’s a very good chance that some negative self-talk has crept into your thoughts. Spend some quiet time being aware of your thoughts and actions. How have you stopped treating yourself well? What caused that change? Awareness is the first step to regaining your sense of well-being and empowerment. If you’re feeling out of control or a loss of empowerment, it may be because you’ve made a mistake or you feel like someone has harmed you. It’s often best to forgive yourself for the error, or to forgive them, and to move forward. Use it as an opportunity to learn more about yourself and apply that information to your future decisions and behaviors. Forgiveness is part of treating yourself well. Depending on what has caused your recent situation, you might also give yourself a little extra room and time to regain balance. For example, if you are feeling bad about your physical empowerment because you cheated on your diet, then forgive yourself and treat yourself to a healthy and positive meal that nourishes your body and your spirit. If you made a mistake at work, you might forgive yourself and then treat yourself well by enjoying a hot bath or a run or something that brings you joy. Finally, there’s nothing that helps you regain your sense of empowerment like taking positive action. When you’re having a difficult day, week, or month, then identify what you can do to make it better and take action. Even in the worst situations that life can throw at you, you always have a say in how you respond, react, and feel. You get to control the thoughts you have, the actions you take, and how you respond to the world around you. Self-empowerment means not forgetting that you are in charge of your life. Sometimes that can be easy to forget. When it happens, become aware, treat yourself well, and take positive action to turn it around.